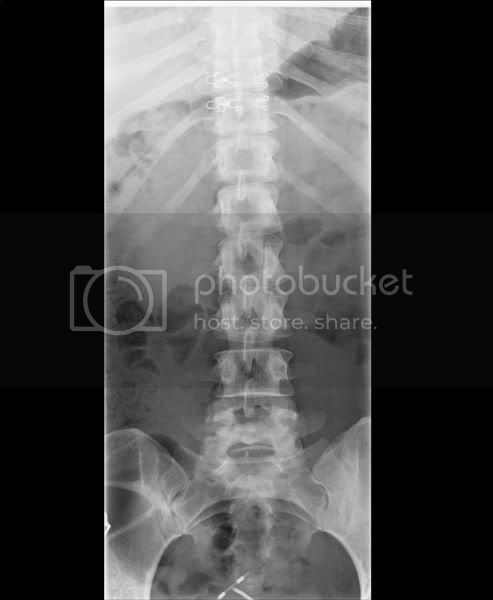 Status: offline 31 year old female has a long history of low back pain. Pain mostly located centrally around L4-5 and L5-S1. No radicular pains but does get radiating symptoms into her left buttock. What are the findings? Status: offline Yes, there seems to be some old/recent fracture lines on the ilium, lateral to the SI. True, the last spinous process looks very odd,compared to the others. Don't know what that is all about. 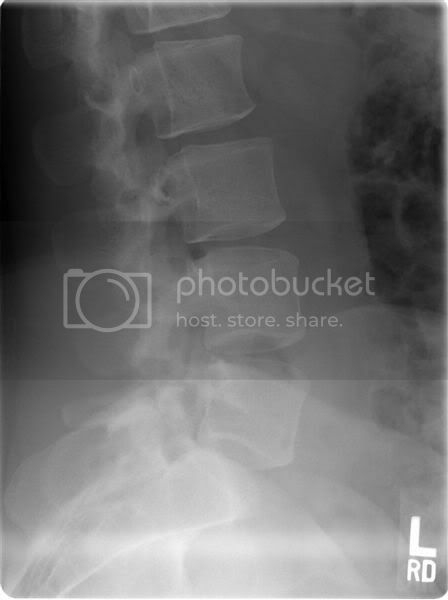 Status: offline Serious spondylolysis going on there (said in my best southern accent). No slippage but bilat pars defects. See 'em frequently. Do the cuboid whip and all is well. The obliques will show it even better, but since this lateral shows it nicely the extra rads are not needed. Can you tell how old the pars defect is on this film? I have a current patient with one of these, without a prior film for comparison, and its not mentioned by the radiologist. Others - I think the ilial fx lines are bowel. I might be wrong, as I often am. Status: offline LOL on the whip Greg. I agree with the spondylolysis. Poor gal probably lost her "scotty dog". I have had fair success using stabilization exercises so they can control the pain. Status: offline [QUOTE]Can you tell how old the pars defect is on this film? [/QUOTE]Not a chance. But if I wanted to impress her, I'd gamble and ask her if she did a lot of gymnastics as a kid. She'll say yes, and you'll be a genius. Status: offline As an aside, the normal curves seem decreased. Is this someone in the military used to standing at attention? 2. Bilateral pars defects as Greg noted. The only way this could be acute is if she had a mechanism of injury which would explain an acute fracture. For the most part, they are stress fractures that occur earlier in life- not congenital as once thought. Don't get fooled into thinking that this is causing her pain, as it may or may not be the case. Flexion/extension or hanging views could help rule out instability. A SPECT (vs a plain bone scan) helps to determine how old the lesion is. The only time this is really useful, is in the young teenager when you suspect a developing pars defect, if you can catch it before it fractures, you can sometimes reverse the process with a good LSO. 3. Probable bone island in the body of T9. 4. 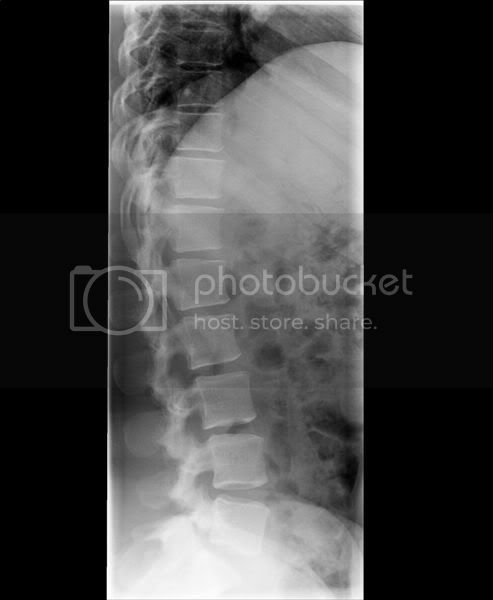 The L5 spinous does look a bit odd- but just a normal varient. Status: offline Kind of straight for the lumbar spine, don't you think? This is probably a recumbent film, which would explain the lack of curves. Status: offline What does the RD on the last image indicate? RD is probably the initials of the tech who shot the films. Status: offline It is a recumbent film. RD are the initials of our radiology tech. I agree I think that this is an old injury, there is nothing in the history to suggest that this is acute. Interestingly, when she actively extends or when you PA glide this segment she gets relief. Here is a question for the Chiros. Would you guys manipulate this? Is this safe to manipulate in your opinion? Status: offline No good evidence that I'm aware of either way Alex as to whether or not manip is a good idea. I don't manip L5 when the defect is at L5, but I'll go above/below with impunity. Empirically, bilat SI manip in the prone position seems to be the best approach for me. If her LBP didn't settle down I'd set up a retake in 6-12 months just to see if it was slipping, take just a spot lat projection. Of all the spondys that I've seen over the years I can only recall two that went on to surgery. We're not as fragile as the radiographs make it seem. Thanks for the replies on the age of the pars defect. As I read your post Jason, I had one of those "Oh yeah" moments, recalling the use of bone scans for active processes. My patient with this is a cancer survivor, (B) paresthesias to the feet/ankle, frequently changing sides, and basically not getting any better. Not a manip candidate (on which I am now trained I might add). I sent her back to the MD. Status: offline Remember though that even w/SPECT, 'aging' a fx can be tricky. Bottom line is that a nuc med study can remain 'warm' for up to a couple of years.